Roland CD-2u: mobile recording made easy, apparently. NAMM 2013: Not everyone likes to do their mobile recording using a laptop or tablet, and Roland is catering for these people with the new CD-2u. This is a battery-powerable standalone recorder that offers SD card storage and an integrated CD burner. Read all about the CD-2u below or on the Roland Connect website. Price and release date are TBC. An SD-only version, the SD-2u, is also available. If you've ever needed to burn CDs (especially away from home) you'll know that it's far from straightforward. You've got to worry about computers, mics, interfaces, leads and that's before getting it all working together. 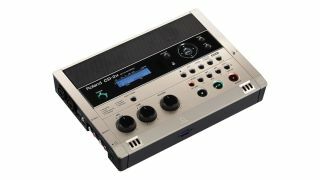 If that sounds like you, then leave the computer at home - the portable CD-2u SD/CD recorder lets you create CDs quickly and easily, wherever you are. The CD-2u has two high-quality stereo microphones built into the front, as well as stereo speakers for listening back to what you just recorded. With everything you need in one small box (with a footprint smaller than an A4 magazine), making a CD is fast and simple. To create your CD, just set the desired recording level and press record. Once you press the stop button: your recording goes onto the CD.You can also connect your own external microphones, electronic musical instruments and other devices. The CD-2u can also help you with music lessons and practice. If you're struggling to learn a piece of music, you can slow it down to study and learn the notes - even when playing commercially-available music from CD. If you'd like to sing or play on top of the existing music, you can even remove certain parts by using the centre-cancel function. Musician's tools including a chromatic tuner and metronome are also built-in meaning there are even fewer boxes to carry, drop or lose. Small, battery powered and with mics and speakers onboard, the CD-2u gives you everything you need to record, edit, play, and burn CDs. The built-in stereo mic makes audio capture easy, while high-performance stereo speakers provide convenient sound playback of your recordings as well as commercial CDs, lesson material, and more. The beauty of the CD-2u is that it gives you everything needed to instantly create great-sounding CDs: compare that with using an array of mics, speakers, leads, interfaces and computer, especially when out and about. Although it's powerful, the CD-2u is all about making life (and making CDs) easy. Thanks to the Easy Guide feature, the CD-2u is simple to use, with clear onscreen instructions that guide you every step of the way. Using the Easy Guide you'll quickly learn about CD backup, creating minus-one tracks for practice and karaoke, setting proper input levels, and other operations. You can even choose among six different languages for the display: English, German, French, Italian, Spanish, or Japanese. The CD-2u also records to readily available SD/SDHC cards, and can also record directly to CD-R and CD-RW discs when using AC power. While it's designed for professional results as a standalone unit, the CD-2u also includes connections to attach external devices (like musical instruments or music players) for various applications. Two XLR/TRS combo jacks allow you to connect your own mics (with phantom power available if needed), including a stereo field-recording mic such as the CS-15RS. There's also a stereo mini-mic jack with Plug In Power, plus stereo RCA LINE IN jacks for connecting an instrument, music player, or other audio sources. The CD-2u is packed with useful tools for developing music skills, as well as other applications such as learning languages, transcribing spoken-word audio, and more. You can independently adjust the audio speed and key (either of your recorded audio or from CD), perfect for slowing down passages to learn difficult parts or changing the key of music to match your voice. Use A-B Repeat to play audio sections over and over, and turn on Centre Cancel to create minus-one tracks for practice and karaoke fun. There's also the newly developed Centre Focus feature, which isolates centre-located sounds in music tracks to make them easier to hear and learn. The optional CB-CD2E Carrying Caseprotects the CD-2u and can also store accessories like CD and SD media, batteries, remote, etc. And if you like the idea of the CD-2u but don't need CD playback/burning capability, take a look at its cousin, the more affordable SD-2u SD Recorderwhich records just to SD cards.